Your employees probably don’t need access to every corner of QuickBooks Online. Here’s how to set limits. One of the best attributes of QuickBooks Online is that multiple users can access it without having software installed on their PCs. No more paying up front for a boxed copy that you’ll store on your hard drive. You just pay a monthly subscription fee. Unless you assign specific access rights to your users, though, they’ll be able to see and do everything that you see and do on the site. You undoubtedly trust your employees or you wouldn’t have hired them, but it’s just good business practice to restrict individuals to their specific work areas. You probably did the same thing if you ever ran a manual accounting system. QuickBooks Online makes this easy. Once you’ve set up individuals for a specific set of screen permissions, that’s all they’ll see when they log in with their user names and passwords. Here’s how it works. QuickBooks Online’s mini-interview will walk you through the steps required to assign access rights to employees. As you can see, four access levels are supported. You’ll probably select Regular or custom user most often because you can drill down and set permissions at the screen level. The Company administrator is you, of course, unless you’ve assigned this role to someone else. The user at this level has access to everything. You can also let someone see Reports only, with the exception of payroll reports and those that contain contact information about customers, vendors, and employees. If you have employees who submit time sheets but don’t otherwise work in QuickBooks Online, you can let them in to do Time Tracking only. Tip: There’s a fifth option here. You can grant us access to your QuickBooks Online company data, making it easier for us to monitor and troubleshoot your accounting information. Let us know if you want to take advantage of this. Click the button in front of Regular or custom user if it’s not already highlighted, and then click Next. This third screen in the mini-interview deals with Customers and Sales and Vendors and Purchases Access Rights. Click All or None if appropriate. If you’re allowing Limited access in these two areas, be sure to read the fine print explaining what is and isn’t allowed. When you’re satisfied with your selection, click Next. On the next screen, you’ll set administrative rights for that user by indicating whether he or she can manage other users’ access rights and work with your subscription status and other company information. You’ll supply the individual’s email address and name on the following screen. This will be used to send an email inviting the user to sign in using an existing Intuit Business Services user name or one he or she creates. Click through the next screen and click Finish when you’re done. The mini-interview will close, and you’ll be back at the Manage Users page. The table here lists all users’ names, email addresses, access rights, billable standing, and status. If you haven’t received a response to an invitation (Invited), you can click the Resend button to issue another email. When he or she responds, Invited changes to Active. Click on a row to highlight an individual, and you can Edit or Delete him or her, and see an audit log of Activity. You or your appointed Master Administrator should set up access rights before any new employee is admitted to QuickBooks Online. Let us know if you’re having trouble with this element of the site, and if you’d like us to join your list of active users. It’s a lot easier for you and us if we can get in there and see what problems you’re having — and resolve them. If you’re not absolutely certain you’re going to stick with QuickBooks Online, you can sign up for a 30-day free trial (no credit card required). You’ll first create an account by entering a user name, password, etc., then be asked a few simple questions about your business and the features you plan to use (invoicing, inventory, bills, etc.). Instead, Intuit has partnered with other small business websites to provides add-ons—applications that extend the usefulness of QuickBooks Online in one or more areas, like accounts receivable and payable, inventory, and expense-tracking. They integrate easily to share data and do the extra work you need. Here are some of them to consider. Bill.com automates your accounts receivable and payable processes. It supports electronic billing and payment, as well as multiple approval levels. You can certainly enter and pay bills using QuickBooks Online. And you can send invoices to customers and receive payments. But adding a connection to Bill.com gives you more advanced options for accounts receivable and payable. Simply send your bills to Bill.com by scanning, emailing, faxing, or taking a picture with your smartphone. The site’s automation tools turn them into digital records and route them through your specified approvers. Once approved, they’re paid electronically or by paper check. Invoices are just as easy to process; customers can pay by using PayPal, credit card, or ACH. Bill.com’s mobile app makes it possible to keep up with invoices and bills while you’re out of the office. Are your employees still paper-clipping receipts to handwritten expense reports? This method is unnecessarily time-consuming – and often inaccurate. Expensify solves both problems. Your staff can take photos of receipts with their smartphones. Expensify then converts the expense information into coded digital records and submits them for approval based on your company’s policies. Credit card purchases can be automatically imported, too. All data is synchronized with QuickBooks Online in real-time and coded to reflect your preference of QBO’s expense accounts, customers/jobs, etc. Once you’ve approved a report, you can have the money deposited in the employee’s bank account the next day. TSheets employee scheduling software automates tasks that QuickBooks Online doesn’t do: scheduling and remote time-tracking for your hourly employees. Your staff no longer has to fill in paper timesheets. Instead, they can use their smartphones to track their hours and GPS location points. And while Excel is certainly better for creating schedules than paper, TSheets takes over that task, too. After you’ve approved timesheets, that information is sent over to QuickBooks, ready for use in your payroll processing. Your employees can easily “punch” in and out using their smartphones. TSheets also uses GPS technology so that your staff members’ locations are always known to you. QuickBooks Online performs some basic inventory management tasks. You can create records for items and use them in transactions, and keep track of the number of items in stock so you know when to reorder (or have a sale). SOS Inventory goes well beyond those capabilities. You can create sales orders, track cost history and serial numbers, and document work-in-progress (WIP). SOS Inventory supports multiple locations and the entire pick/pack/ship process. You can create thorough customer records in QuickBooks Online and document some of your interaction. But it doesn’t facilitate true Customer Relationship Management (CRM) nor project management. Insightly CRM does both. It lets you build exceptionally thorough customer profiles so that you can view social streams, email history, and any events, opportunities, or events related to them. Its project management features include the ability to track by pipelines or milestones, define contact roles and custom fields, and generate advanced project reporting. All of these apps can work in standalone settings, but their integration with QuickBooks Online and their mobile capabilities create powerful partnerships that help you serve both your customers and your employees in ways that QuickBooks Online alone can’t. We’re not trying to sell you applications here. Our concern is that you’re getting as much out of QuickBooks itself as you can. We can steer you toward add-on solutions if that seems necessary, but we’re always happy to work with you on getting to know QuickBooks Online better and matching its capabilities to your company’s needs. Warning: Because you may be “handling” a lot of your bills twice in QuickBooks Online, this system can take some getting used to. We’ll be happy to walk you through the process until you’re comfortable. Before you can pay a bill, you must create a template and enter its details. You can even set up payments to recur, as shown here. To review quickly, we created a bill by clicking on the plus (+) sign at the top of the screen and selecting Bill under Vendors. Once you’ve created a bill, you can click on Make recurring at the bottom of the screen to establish periodic payments (as pictured above). You can choose to have payments that are always the same sent automatically, or you can request a reminder so that you can change the amount before emailing or printing. Those reminders appear when you first log into QuickBooks Online. You can access them by clicking on the corresponding link under Tasks. QuickBooks Online makes it very easy to pay bills. You can do so from a handful of different screens on the site – sometimes in multiple places on the same page. Click on the Vendors tab in the vertical toolbar on the left side of the screen. 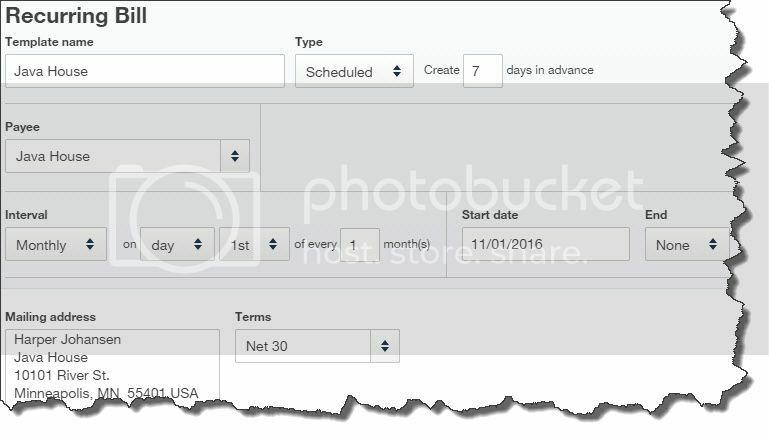 The page that opens displays a horizontal chain of bars near the top, color-coded to indicate what they represent: Purchase Order, Open Bills, Overdue, and Paid Last 30 Days. Each segment tells you how many transactions share that status as well as their total dollar amount. When you click on a segment, the table below changes to include a list of the actual transactions. At the right end of each line is a Make Payment link that you can click to get a payment screen. If you want to see the actual bill that was sent, click on the Vendor name itself. You can click on the plus (+) sign at the top of any screen where it appears and go to Vendors | Pay Bills. Open the bill itself and click on the Make Payment link in the upper right corner. When you’ve opened a bill that you want to pay, double-check the information in the upper part of the screen. The Vendor details should, of course, be correct, but make sure the date reads as it should. And look in the box to the right of the vendor’s name. If it’s not displaying the correct account for the transaction, click on the double arrows and select the right one. QuickBooks Online will follow its own numbering system for bill payments. If you want to assign your own by entering a reference number of some kind, delete what’s showing in the Ref no. field and add your own. The Bill Payment # in the upper left will change to reflect that. If there are multiple bills in the list below, click in the box in front of the one(s) you want to pay to create a checkmark. Look at the end of each line, too. QuickBooks Online defaults to a full payment for bills. If for some reason you’re planning to make a partial payment, replace the dollar amount in the Payment box with your own. In the bottom left portion of the screen, you can enter a Memo if you’d like and add an Attachment. When you’ve checked everything for accuracy, click Save and close or Save and new in the lower right corner. Paying bills manually can be painful. Beyond the fact that you’re watching money leave your accounts, the mechanics of writing checks and/or dispatching electronic payments on time—and keeping everything organized—can be a constant challenge. QuickBooks Online’s bill-paying tools can help with that. Make a good impression on your customers by sending them well-designed sales forms. QuickBooks Online helps you create them. Your company’s “brand” can be composed of many things (and has many definitions), but it’s really about what pops into your customers’ minds when they think of you. Key components include your logo, your color scheme, and any other identifying visual element that people associate with your business. A good way to reinforce this image is by making sure that a unifying graphic theme runs through every piece of print or web-based customer content you create, like your website, brochures, blog, and ebooks. Your brand should also be visible on all sales forms you dispatch, like invoices and receipts. QuickBooks Online comes with its own default sales form style; this is the layout and content that will automatically display when you start a new transaction. You can easily change this and have it apply to all transactions. Your logo is an important element of your company’s brand. 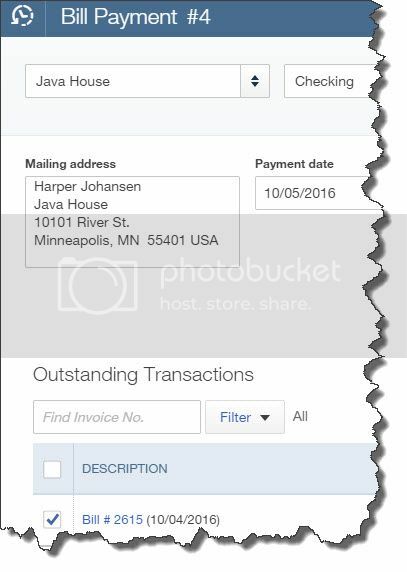 QuickBooks Online lets you include it on sales forms. Here’s how it works. Click on the gear icon in the upper right of the screen, next to your company name. Select Custom Form Styles to open the table of existing styles. There should be one labeled Standard, though there may be another labeled Classic. You can make either the default by clicking Make Default or Remove as default using the down arrows and links under ACTION at the far right of each row. Click the Edit link for the default style. This screen contains many of QuickBooks Online’s customization tools. The Style tab in the left vertical toolbar is automatically highlighted. In the column to its right, click through the five design options available and leave the desired one selected. Then click the plus (+) sign in the upper right of the screen. Browse for your logo file when the directory opens and double-click on it to add it to the top of your sales forms. Choose the color scheme you want by clicking in the correct box displayed below. When you’re done there, click on the Appearance tab to specify your logo’s placement and change any other settings. You can decide which fields should and shouldn’t appear on your sales forms by checking and unchecking boxes. You won’t necessarily need to make every data field available on your sales forms. But you want to include every field you might possibly need without displaying extraneous content areas. QuickBooks Online lets you turn fields on and off and change their labels easily by checking and unchecking boxes. Form names. Do you want invoices to say “Invoice,” for example? Do you want to use form numbers and allow custom transaction numbers? How much of your company’s contact information should appear? Do you want fields for Terms, Due date, etc? Do you need to define custom fields? You’ll see more options when you click on the Activity Table tab in the left vertical pane (see image above). Not only can you choose what content appears and how its labels read, but you can also indicate what percentage of that line each entry should occupy. Under WIDTH%, click on the plus (+) and minus (-) buttons to the right of each number to size it (your numbers, of course, should total 100). Warning: Many of the decisions you have to make when customizing sales forms are simple. Others take some consideration, like custom fields and the handling of billable time. We can help you with these. Click on the final tab in the left navigation pane, Footer, to add or edit text that should be displayed at the bottom of your sales forms. Click Save in the lower right when you’re done. Some settings may need to be tweaked in Account and Settings. Note: As you’re browsing through the content options available as described above, you may find that a field appears to be missing or needs a default setting changed. If this occurs, click on the gear icon in the upper right of the main screen, then on Your Company | Account and Settings. Click on the Sales tab in the left vertical pane to get to Sales form content. Consistent, well-designed sales forms will help promote your brand and present a polished, professional image to your customers. Welcome to the first Bright Bookkeeping Blog. We provide bookkeeping to service companies both virtually and on site along with QuickBooks training and consulting and Payroll. We will be providing QuickBooks tips and tricks to help you out as well as additional add on products that will make your life easier so check make monthly. If you have QuickBooks questions please let me know and you may see them covered in a future post. Don’t forget to sign up for the newsletter as well.